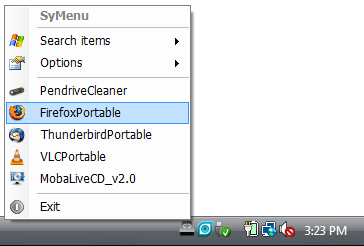 SyMenu is a Portable Start Menu for USB devices. It can be used much like a Windows Start button to quickly launch your portable software applications and programs from the USB device. Registering new applications to be added to the SyMenu right click menu is a simple drag and drop affair, making SyMenu Portable Start Menu a very intuitive and super easy to use USB Launcher. SyMenu runs on Windows 2000, XP, 2003 Server, Vista, 2008 Server. The only requirement is that your PC has .NET Framework 2.0 or higher installed.